Just done with final crit. I thought I would bounce into the bed and sleep to the max once I reached my room. But then, I watched drama, blogged, accompanied Puisan to studio gallery to see the students’ work again, went to Aldi for groceries and hanged out at puisan’s for dinner. 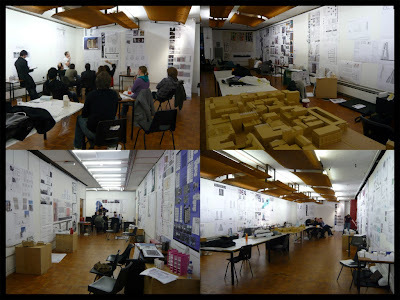 The year 3 studio presentation in Strathclyde is supposed to be held discreetly and privately (only between the presenter, assessors and peer crit). Without knowing it, in the beginning of assessment, I was lingering around the gallery, taking photos and figuring out the reasons for the gallery was empty and other classmates were hanging out at the lobby instead of listening to the reviews. Unlike the days back in Taylors, the studio final presentation here was held like an exam or interview which each individual or group strategy unit went in after another. Anyway, these are the photos of the gallery where everyone’s works were pinned up…..